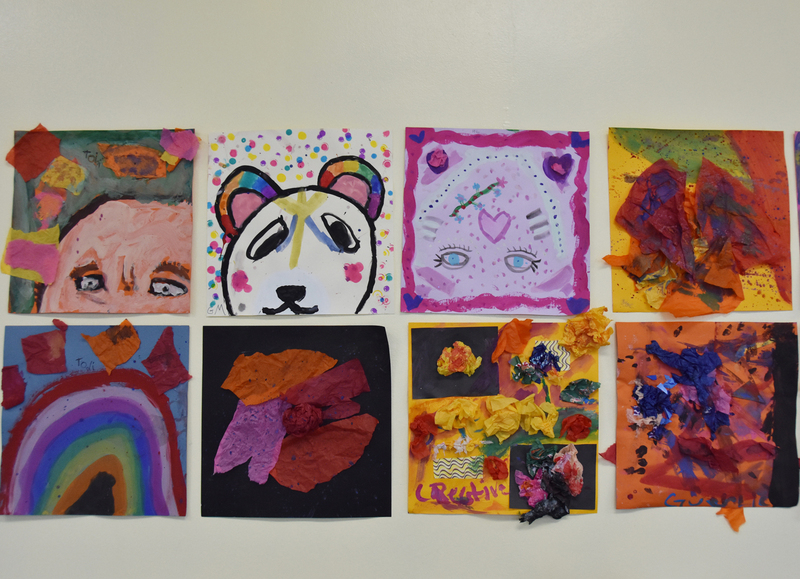 DORCHESTER, MA — BGCD’s arts programs came together this week to host the quarterly Arts Bash event focusing on winter classes. 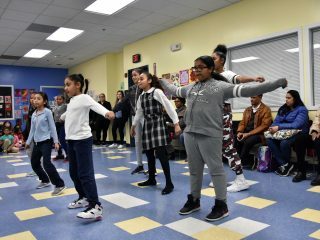 There were displays hung from the winter fine arts classes, a photography exhibit, music performances and a recital by the Club’s hip-hop dance teams. 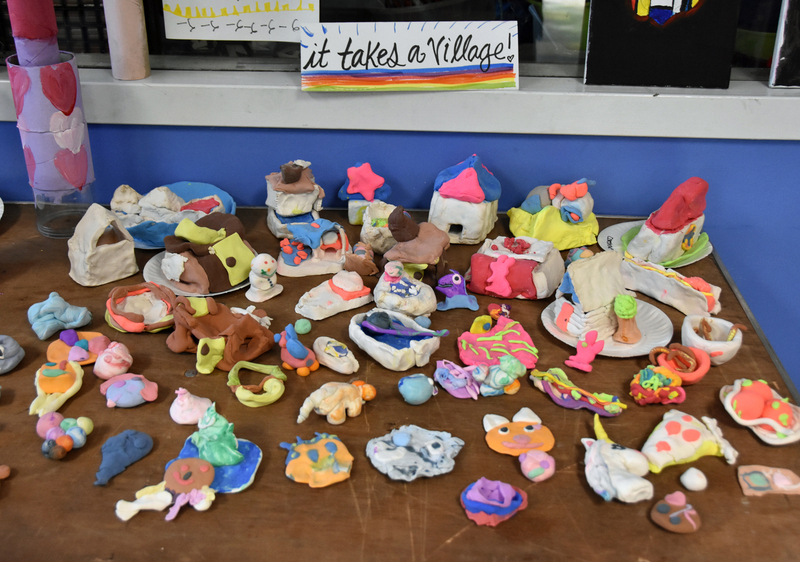 Our members were so excited for the chance to show off some of their hard work to parents, siblings, teachers and other community members. Congratulations and thanks to all the participants. We’re excited to see what’s in store for our members this spring! 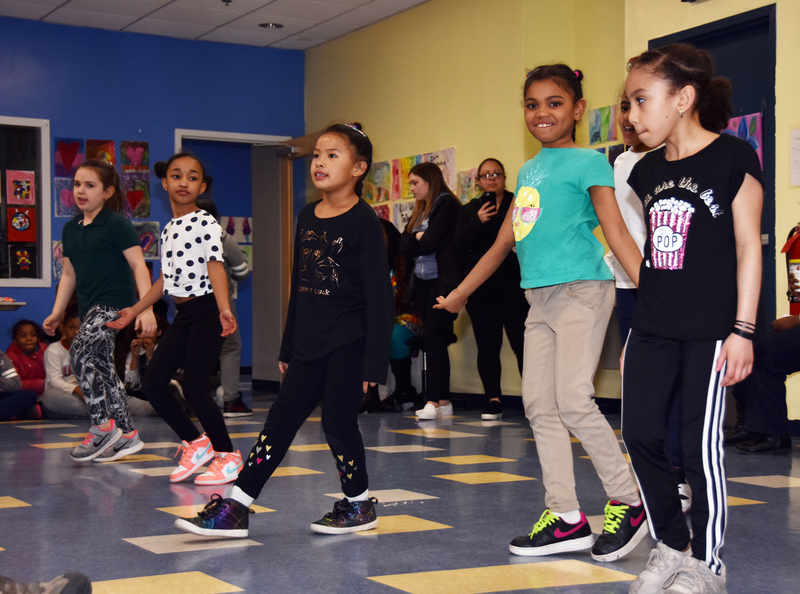 For more information on our upcoming spring enrichment programs for Music, Fine Arts and Media Arts please contact Katy Farrar at kfarrar@bgcdorchester.org. 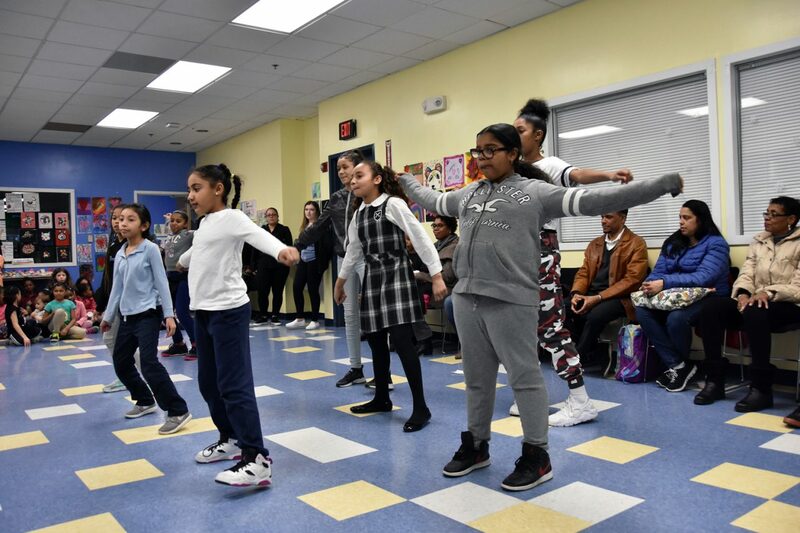 DORCHESTER, MA — Club members and staff of the Walter Denney Youth Center collaborated to put on an informative “Living Museum” performance in celebration of Black Hisory Month. 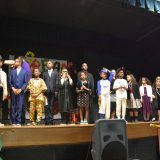 They honored and taught guests about many important historical figures and individuals who are making a difference still today. 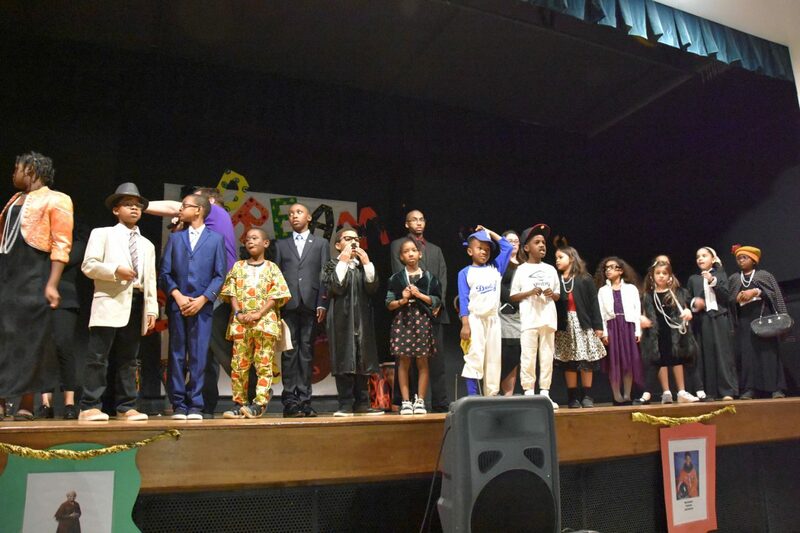 They recognized a wide variety of different people ranging from Jackie Robinson, Rosa Parks, Wilma Rudolph, Michelle Obama, W.E.B Dubois and many more! Thank you to everyone who came out to support the performance! 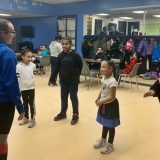 For more information on programming at the Walter Denney Youth Center please contact Queenette Santos at qsantos@bgcdorchester.org. 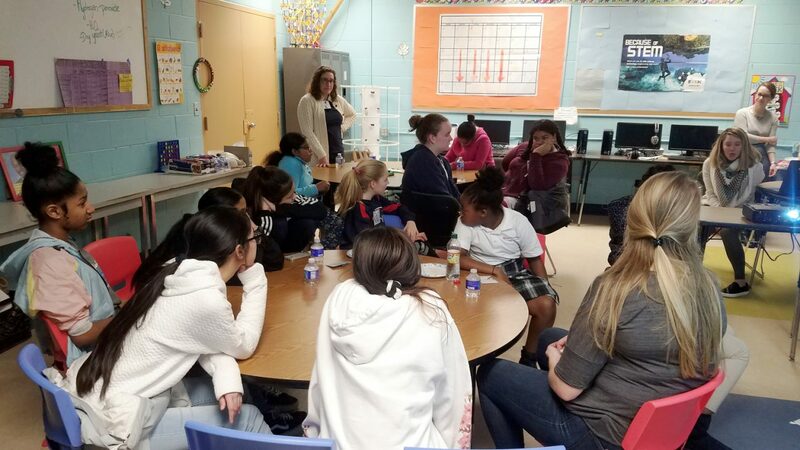 DORCHESTER, MA — BGCD is excited to partner with the Junior League of Boston’s Building Bridges STEM Program. 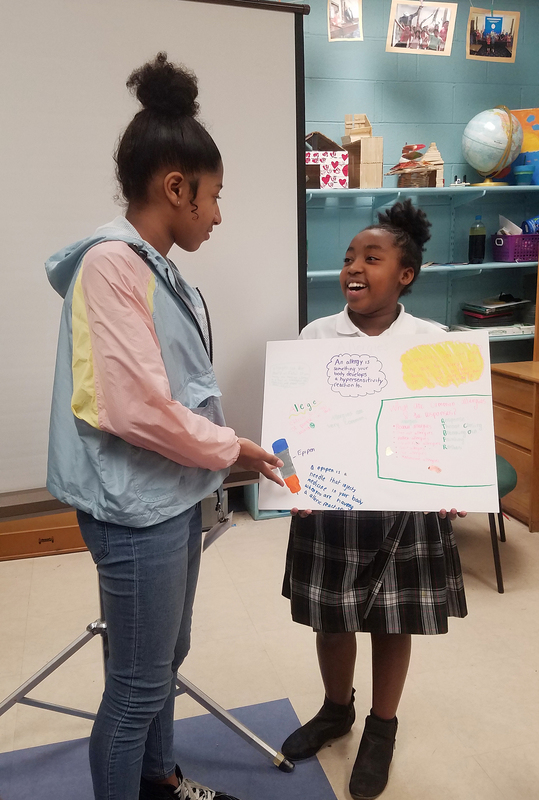 Middle school girls from the Club will meet every other Monday through May in this exciting Science program which is being led by women who are leaders in the field of STEM. To support the program we are also excited to announce that John Kawola from Ultimaker has donated a brand new 3-D printer which will be used in the class. In week one the members learned about allergies and how to use epi-pens. We’re excited to see what other fun learning opportunities result from the class. 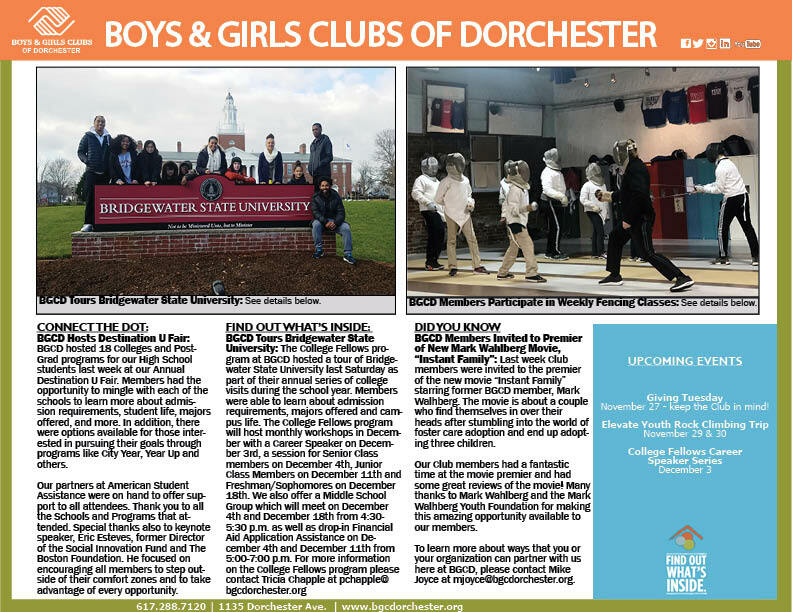 For more information please contact Education Director, Joel Figueroa at jfigueroa@bgcdorchester.org. 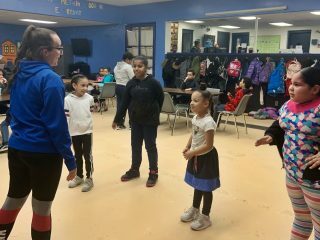 Marr-lin Swim Team Hosts Nashua: This past Saturday the Marr-lin Swim Team at BGCD hosted the Nashua Club for a dual-meet as part of the regular season schedule of meets. Both teams enjoyed a number of improved times from their respective swimmers. The Marr-lins will host the Waltham BGC on Saturday, December eighth and the Salem, NH BGC on Saturday, December fifteenth prior the school beak before resuming the dual-meet schedule in January. Congratulations to the Marr-lin swimmers on an outstanding performance! 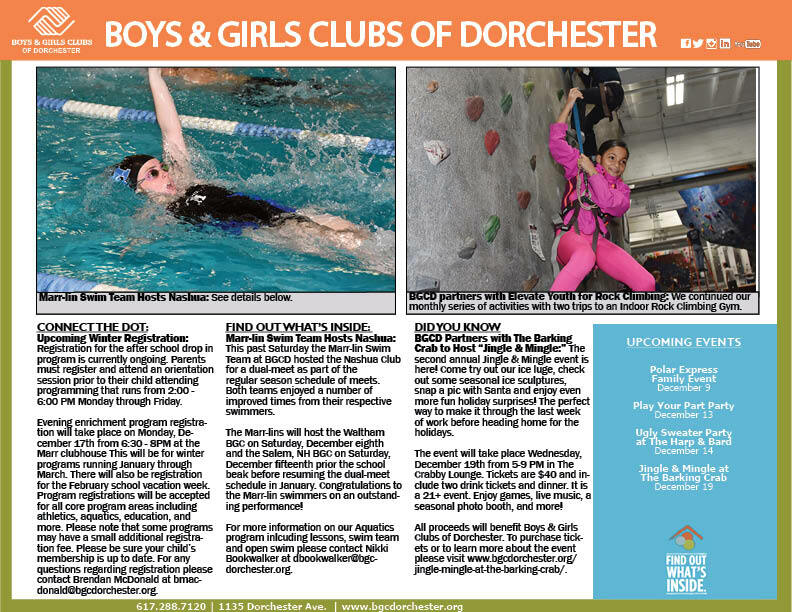 For more information on our Aquatics program inlcuding lessons, swim team and open swim please contact Nikki Bookwalker at dbookwalker@bgcdorchester.org. 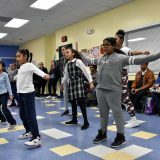 BGCD Partners with The Barking Crab to Host “Jingle & Mingle:” The second annual Jingle & Mingle event is here! Come try out our ice luge, check out some seasonal ice sculptures, snap a pic with Santa and enjoy even more fun holiday surprises! The perfect way to make it through the last week of work before heading home for the holidays. The event will take place Wednesday, December 19th from 5-9 PM in The Crabby Lounge. Tickets are $40 and include two drink tickets and dinner. It is a 21+ event. Enjoy games, live music, a seasonal photo booth, and more! 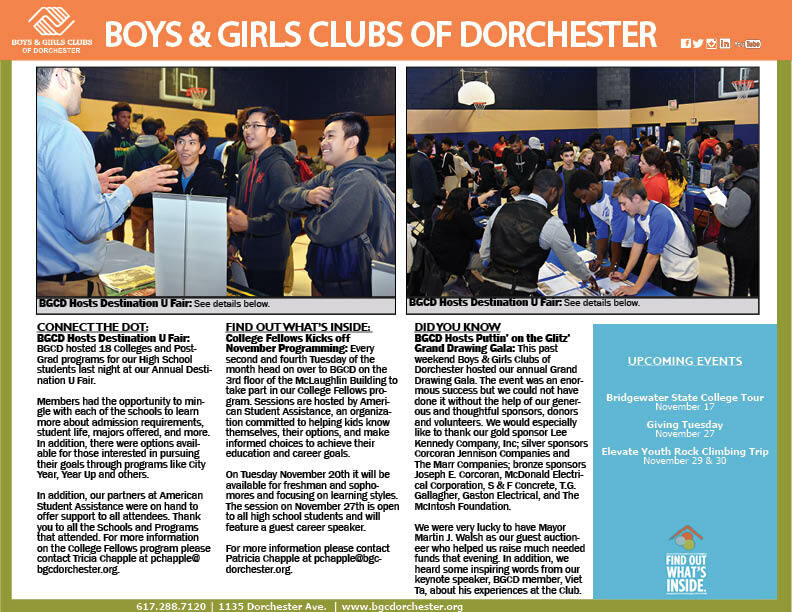 All proceeds will benefit Boys & Girls Clubs of Dorchester. To purchase tickets or to learn more about the event please visit www.bgcdorchester.org/jingle-mingle-at-the-barking-crab/. 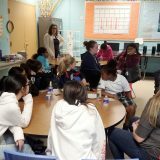 BGCD Continues Career Speaker Series: The College Fellows program at BGCD hosted Radiologic Instructor, Stacy Gosselin, to continue their career speaker series. Members were able to learn about Stacy’s career path and the kind of work that she does. The College Fellows program will host monthly workshops in December with a career speaker on December 3rd, a session for senior class members on December 4th, Junior class members on December 11th and Freshman/Sophomores on December 18th. We also offer a Middle School Group which will meet on December 4th and 11th from 4:30-5:30 p.m. as well as drop-in Financial Aid Application Assistance on December 4th and December 11th from 5:00-7:00 p.m.
For more information on the College Fellows program please contact Tricia Chapple at pchapple@bgcdorchester.org. As a partner agency of the Rodman Ride for Kids, BGCD sent 150 members and chaperones to see the show. The musical is about the rise and fall of Founding Father Alexander Hamilton, who was the first U.S. Treasury Secretary. The performance offered a great deal of history to our members who were excited for this fun opportunity to learn. It was an amazing night for all. Thanks to Don for making this fantastic opportunity available to our members. 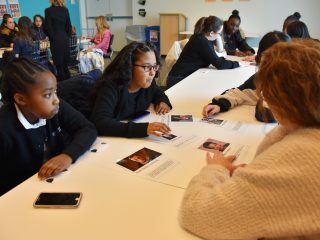 BGCD to Host Destination U College Fair: On Wednesday, November 7th BGCD will be hosting our annual Destination U College Fair from 6:30 – 8 PM in the Marr Building. This event is an opportunity fair for life after high school. Throughout the night there will be college and career panel discussions with admissions officers, alumni, current university students, professionals and college access counselors. Representatives from over 17 different colleges will be attending the event. In addition, we will also be offering food, raffle prizes, collegiate gear, and information on different scholarship opportunities. To learn more about this event or to RSVP please contact our Education Director, Joel Figueroa, at jfigueroa@ bgcdorchester.org. Sunday Night Football Bus Comes to BGCD: The Sunday Night Football Bus, sponsored by NBC-Sports and Comcast, stopped by our Clubhouse last Friday in advance of the New England Patriots hosting the Green Bay Packers last week! Members got the chance to decorate footballs, received complimentary give-a-ways, toured the bus and participated in plenty of fun interactive activities! Members interacted with Patriots cheerleaders as well as New England mascot, Pat the Patriot, and even pretended to give a live news broadcast using some of the equipment on the bus! We are so thankful to NBC Sports for stopping by our Clubhouse and giving our members this unforgettable experience. Six year old Eithan Anannon was named the winner of the painted football contest and will get to have his ball remain on the bus for the rest of the year! College Fellows Kicks off November Programming: Every second and fourth Tuesday of the month head on over to BGCD on the 3rd floor of the McLaughlin Building to take part in our College Fellows program. 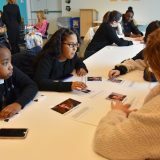 Sessions are hosted by American Student Assistance, an organization committed to helping kids know themselves, their options, and make informed choices to achieve their education and career goals. On Tuesday, November 13th the program will be targeted at juniors and focusing on self-advocacy. On Tuesday November 20th it will be available for freshman and sophomores and focusing on learning styles. The session on November 27th is open to all high school students and will feature a guest career speaker. 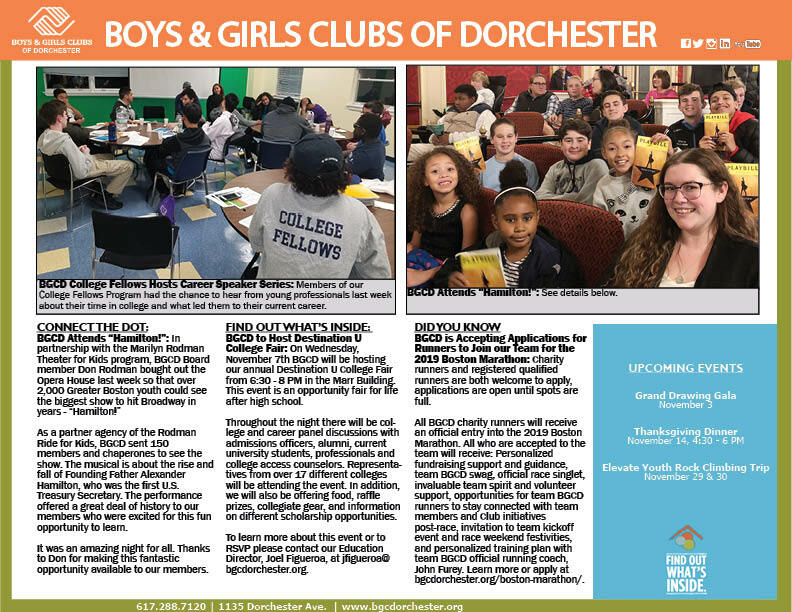 For more information please contact Patricia Chapple at pchapple@bgcdorchester.org. 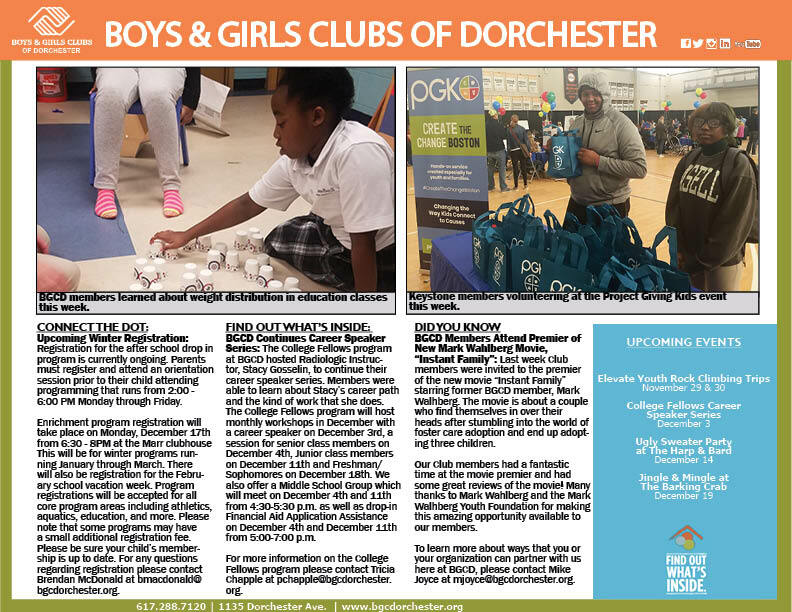 BGCD Hosts Puttin’ on the Glitz’ Grand Drawing Gala: This past weekend Boys & Girls Clubs of Dorchester hosted our annual Grand Drawing Gala. The event was an enormous success but we could not have done it without the help of our generous and thoughtful sponsors, donors and volunteers. We would especially like to thank our gold sponsor Lee Kennedy Company, Inc; silver sponsors Corcoran Jennison Companies and The Marr Companies; bronze sponsors Joseph E. Corcoran, McDonald Electrical Corporation, S & F Concrete, T.G. Gallagher, Gaston Electrical, and The McIntosh Foundation. We were very lucky to have Mayor Martin J. Walsh as our guest auctioneer who helped us raise much needed funds that evening. In addition, we heard some inspiring words from our keynote speaker, BGCD member, Viet Ta, about his experiences at the Club.